ING Direct appears to be sending a survey about Apple Pay to its customers in Australia, according to a tipster who sent us the photo below. While the bank has yet to officially implement Apple Pay, the survey suggests support could be imminent for its "Orange Everyday" debit and credit cards. ING Direct Australia had nearly 420,000 customers with Orange Everyday accounts open as of December 2015. Here's a list of Apple Pay banks in Australia. 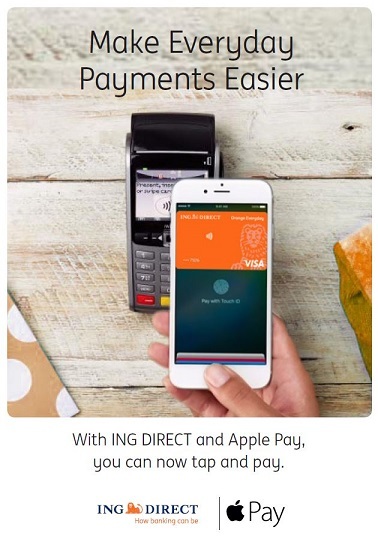 Update: Apple's website now says Apple Pay is "coming soon" to ING Direct and Macquarie customers in Australia. No exact timeline was specified. Pretty funny, first Australian banks sue Apple to try to force them to allow direct access to the NFC chip and payment capabilities, bypassing Apple Pay. Now that they got shot down they're sending surveys as if this is something nobody wants. If nobody wants it, why are you suing Apple to try to get access to the NFC chip? This is not one of Australia's Big Four banks involved in that matter. ING is my primary bank, and I'm a little sceptical that Apple's cut of each transaction wont eventually filter back into my own pocket, in the form fees, or lesser ING insentives/rewards. Afterall, the main reason I imagine most are with ING is to avoid the ridiculous fees of the top 4. Would really want more information before giving a nod to applepay in that customer survey. Strange that they feel they need to run a survey for this. Most everyone uses contactless cards in Australia anyway, so it might not be worth the effort/cost if their customers don't feel like they need it. The thing with this is, at least in my experience I didn't know if I'd like Apple Pay all that much until I tried it (because I could). I ended up liking it more than I thought I would. As with most surveys, the results may depend to a large degree on what exactly is asked. If they ask people "Would you like Apple Pay, which is just like another form of the contactless card you already have?" they might get a less positive response than something like "Would you like to be able to pay on your iPhone without even needing your cards present, have them protected by Touch ID, and have your actual card numbers insulated behind alias numbers for a further layer of security? ", where they might receive more positive interest in it.